The majority of information used for this page was a biography provided by the family and the book "On Final Approach", by B. H. Granger. Additional pictures were provided by family and friends. Marcia E. Courtney Bellassai was born in Hartford, Wisconsin on March 5, 1919. She graduated from Hartford High School in 1936. Like many of the WASP, Marcia joined the Civilian Pilot Training (CPT) program while working to get her BA. She obtained her CPT training at the University of Wisconsin and got her private license in 1940. She had completed the primary training in an Aeroncas and secondary, acrobatics, in a Waco biplane. She was about to start her instructor training when women were forced out of the program. She was able to use some of her ground school training to complete her Political Science degree in 1942. From spring of 1941 to December of 1942, Marcia worked for Piper Aircraft Corporation and ferried Cubs around the country including deliveries to Texas and an Army glider school in South Dakota. During this time she also joined the Piper Civil Air Patrol Squadron and became part of an advertisement for the Elgin Watch company in her CAP uniform. In December of 1942, Marcia joined the WASP along with Lois Brooks, Lois Hollingsworth, Betty Deuser, Emma Coulter, Mabel Rawlinson, Joyce Sherwood, and others in class 43-3. After basic training was completed in Sweetwater, Texas, she was initially sent to Romulus, Michigan, and was then sent to the Tow Target Squadron at Camp Davis, North Carolina, where she flew antiaircraft artillery missions in the AT-6, A-24, A-25, and B-34. In 1944, first Joyce and then she were transferred to Liberty Field, Georgia, where she continued to fly the B-34 at Camp Stewart for tow target practice. Lois, Holly, Betty, and Emma had been sent to Biggs Army Air Field in El Paso, Texas. Mabel was killed while training at Camp Davis. 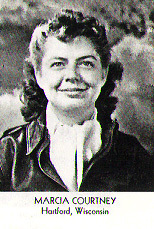 After the WASP were deactivated in December, 1944, Marcia accepted a job as an aircraft accident analyst for the Air Safety Division of the Air Transport Command (ATC) in Gravelly Point, Virginia, where she worked a variety of tasks supporting the development of the Air Safety Program. From here she worked for the Joint Attache' Office, U. S. Legation, Bucharest, Romania, and spent her time analyzing and reporting on economic intelligence. 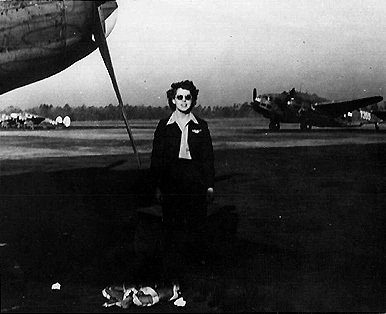 While stationed in Romania, Marcia traveled throughout Europe and made her last flight as the co-pilot on a C-46 going from Rome to Paris. While in Romania, Marcia met Anthony Bellassai, a member of the US Signal Corps. In 1949, Anthony and Marcia were wed. They have been with each other ever since and have raised 5 children, Marc, Tony, Gina, Elissa, and Cara. The family spent their time traveling around the U.S. and Germany until Anthony retired as a Major in 1967. She and Anthony now live in Sierra Vista, Arizona. Marcia also has five grandchildren, Brian, Joseph, Graham, Preston, and Kara. After Anthony's retirement, Marcia graduated from the University of Maryland with her masters in Library Science in 1972. She worked on several research projects and helped develop a packaged training program. She also worked as a consultant for Westat Corporation, Public Research Institute, King Research, and V.E. Palmour. During her consulting work, she co-authored a planning manual for public libraries, a survey of federal libraries in 1972 and authored another federal libraries survey 1978, and the Summary Report for the White House Conference on Literacy in 1980. Marcia is currently working on a history/geography project to relate chronologically world wide historical development. She completed a family genealogy/photo album project.